Google has updated its Android Developers portal to reflect the state of all Android devices currently in use, noting that its new Android 4.0 Ice Cream Sandwich software is currently in use in 0.6% of devices. The search giant refreshes its Platform Versions page bi-monthly, charting the usage of each of its Android software releases, and today releases the first statistics for Ice Cream Sandwich usage since it launched. Although 0.6% is a tiny figure, especially when compared to Gingerbread, which runs on 55.5% of the devices currently in operation, there are only a handful of devices officially running the software — two of them being the Samsung Galaxy Nexus and the Nexus S.
Combined, Android 4.0 – 4.0.3 counts for the same percentage as Google’s first release — Android 1.5 (Cupcake) — which is comprised of devices that have not been supported by the search giant or have not been offered upgrades by their carrier to a newer firmware. Google is very vague (to the point of obfuscation) about Android, but Google disclosed 200m activated devices in the second week of November, and Andy Rubin tweeted 700k daily activations on 21 December. A straight multiplication gets to 230m or so activated devices today – not a very good number but better than nothing. Now, activated devices isn’t the same as devices active today (which is the number to apply the ICS % to) because some old ones will have been deactivated. But in reality Android has only really been on sale since 2010 so very few devices are more than 2 years old, and we can ignore this today. In the course of 2012 I’ll have to start making an estimate of that. We have no way of knowing how this breaks down between upgraded and new devices (though Google presumably has that data) so it can’t be compared directly to iPhone sales. 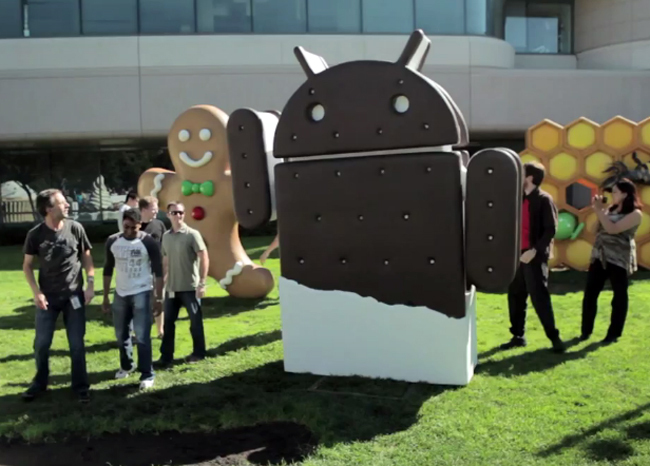 Are there really between 1.3 million and 1.5 million Ice Cream Sandwich devices currently in operation? We know that the Galaxy Nexus has sold well since its launch in November last year and we also know that the Nexus S was a popular Android device. Samsung has also been launching Android upgrades for the Galaxy S II and other ports have made their way via Cyanogen releases. We won’t know an accurate figure, at least until Samsung and other device makers share figures. Ice Cream Sandwich seems to be off to a healthy start and will only continue to grow given the support it has from Samsung, HTC, Sony Ericsson, Motorola and LG.